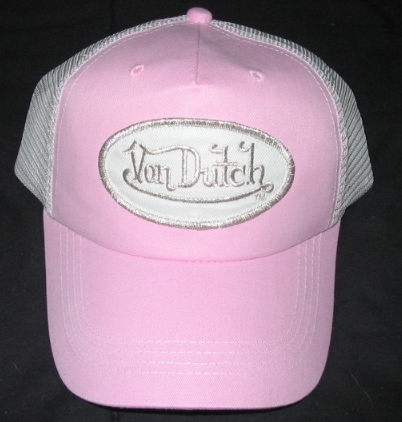 Von Dutch is a multi-national company that seems to sell an experience along with merchandise. A quick look at their "stores" web page, at www.vondutch.com, shows a lot of small stores and what could be considered independent dealers, or distributors. It's hard to tell. What we can tell from their actions is the Von Dutch has an inflated ego, nitwits working for them a low opinion of their customers and a mis-guided grasp of reality. Wow! What makes Von Dutch tick is harder to figure since they are shutting down auctions of legitimate products and not responding to emails asking why. That earns them this spot in Tabberone's Trademark & Copyright Abusers' Hall of Shame. Our opinion has always been that if a company can take the time to search and destroy, they can take the time to answer emails as to why they ordered the termination of the auctions. What they demonstrate by this tactic of avoidance is that they are a collection of assholes who believe they are more important than anyone else. Contact email from a seller, May 25, 2004.
eBay email terminating auction, dated May 22, 2004. Please note the high-quality weasel-wording by eBay. eBay take-down email dated May 22, 2004.
eBay suspension email dated May 24, 2004. Von Dutch Hat that was listed. And seller is fighting back but we will see what happens. eBay Garbage email disclaiming any responsibility for terminating auction by Travis, June 1, 2004. Frustration email from Renee, June 22, 2004. Contact email from Jeff about terminated auction, dated July 22, 2004. Fighting back email from Jeff dated July 22, 2004. One resource we often use is the US Patent and Trademark Office web site. It can get you the name of an attorney. On February 26, 2004, attorney Donald S. Grier filed a trademark application for Von Dutch. Checking the California Bar for this name, we get dsglaw@att.net as his email address and information that seems to indicate he is not affiliated with any law firm. But, just because Von Dutch is located in California doesn't mean their attorney is also located there. Von Dutch Originals Corporate Headquarters is located at 819 N La Brea Ave, Los Angeles CA 90038, 323.651.5800. Our question is what sort of reputable attorney has an "ATT" email address for business purposes? A bottom of his class attorney? So, what's happening? It looks like Von Dutch is on a Witch Hunt and closing legitimate auctions. Shame on you, Von Dutch. May your wooden shoes get termites. Our new motto, thanks to an eBay seller, So many VeRO Members (and their law firms), so few with integrity.